Textured polish is all the rage this year. I am totally loving it. I was concerned the texture would bother me when it first came out. I admit I am constantly feeling my nails when I'm wearing the texture, but in a good way. It's amazing looking as well. I adore this trend! JulieG Hot Cinnamon is from the Frosted Gumdrops Collection just released this spring. I loved them so much I did the pre-order and had them delivered to my house. I have pretty much decided I'd rather pay the shipping fee than drive around trying to find out if the drug store has the newest polish in stock. And JulieG didn't even charge shipping. Winning! 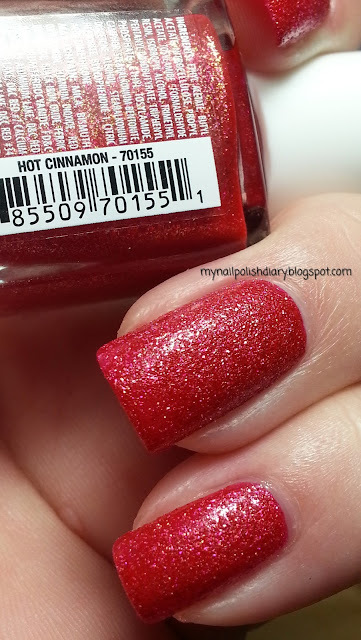 Hot Cinnamon is a cherry red textured polish with a silver shimmery effect. It really does look like a gumdrop. Way to go Julie! I got the whole set and can't wait to try the others out. All 6 are lovely. The wear on this polish was amazing. I wore it like 5 days and never did get any chips. Removal isn't as bad as a glitter bomb, but more difficult than creme polish. I did the foil method, though you probably wouldn't have to. I just like using the foil because a) it's easy and b) I feel like rubbing against the texture, (same for glitter), isn't good for my nails. I am uber protective of my nails! I do realize some might say the acetone on my skin/nails in the foil isn't good either. Correct. It's not. I do take precautions. I coat my cuticle and skin with cuticle oil while using the foil method and I coat again afterwards with oil for several minutes before I do my next mani. It works well for me.